Picture taken two weeks before he died in 2001. On Halloween, ten years ago, I could hear the water fill up in his lungs which was ultimately how he died. I was holding his hand along with other family members as we prayed. At one point he had a look on his face and was trying to say something but he couldn’t get it out of his mouth. We told him to go, to fight no more, and to be with Jesus. Then, he died while holding my hand. It was an experience I will never forget as it made me aware of how the veil between heaven and earth is so thin. Here I am ten years later, watching my good friend Angela battle cancer. 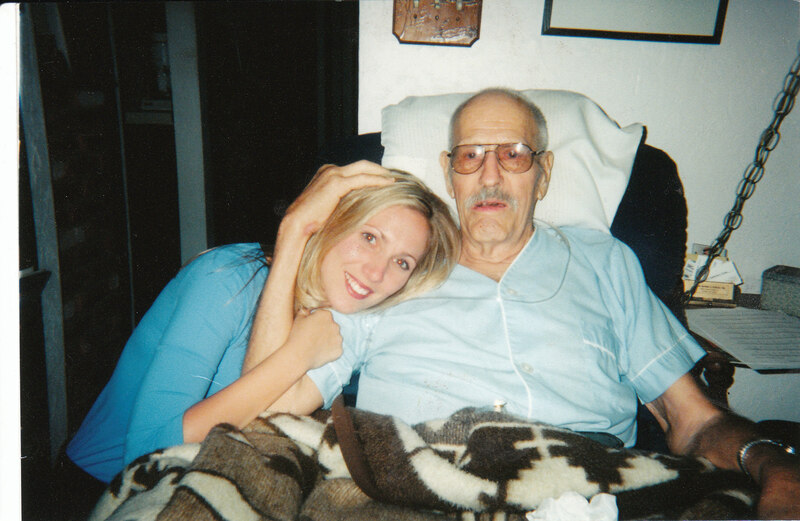 The difference between Angela and my grandfather is that he wanted to die because ultimately the pain was too much for him to endure, while Angela is determined to live regardless of the physical pain she endures daily. She has stage four colon cancer that has spread to the liver. After chemo, radiation and alternative methods of care, her doctors say her tumors are inoperable which means they believe it is incurable. 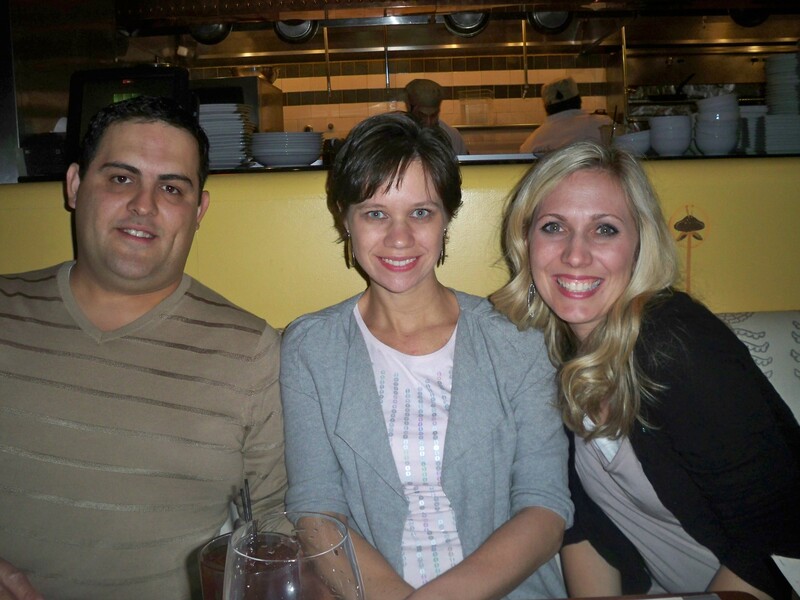 Angela is married to Chris (pictured above) and has two young children. Walking through the experience with my grandfather has prepared me in a way to walk through this shocking, confusing time with her. Once again, as with my grandfather, the impact of her suffering is teaching me lessons in life. I am learning about the grace that comes from suffering as Angela clings to the Lord at every turn. Although she has lost a significant amount of weight and hair, she has never looked more radiant, and when I see her, I literally feel the presence of the Lord in her peace as she trusts in Him during a time so many would find doubt. Although the doctors are not optimistic about the possibility of her recovery, she is not giving up. She is holding firm to the ties that bind her to her children and husband and she is not letting go because she has a fight within her that I do believe can conquer cancer. I was with her in the hospital yesterday as she was admitted for a new infection that is causing her an incredible amount of pain. I asked her how she was and she said, “God doesn’t give us more than we can handle, so he must know that I will be able to endure this.” I got weepy as I expressed my sorrow in what she was going through. She said, “I received the Anointing of the Sick yesterday and I feel blessed to have received that gift as most may never have the experience. It was wonderful.” I sat in amazement as she spoke in such trusting, beautiful language about this situation that I look at as a nightmare. She is teaching me about trust and dignity. I brought three other friends to her hospital room one night and we prayed with her. It was powerful! Not that we had any power, but rather we evoked the name of Jesus to take reign of this cancer, the Holy Spirit to bring her peace, and Mother Mary to be a mother to her children while she was away from them this week. We called upon saints to intercede for her. My most treasured moment of this prayer-time was when my friend Francesca prayed. Francesca tragically lost her five-year-old daughter not even a year ago to the flu. I have spoken about Francesca’s blog before as it is one that always inspires my faith. Francesca found out we were going to pray for Angela. Both of them knew of each other and have prayed for the other in their times of suffering but had never met until this encounter of prayer. During the praying, Francesca said to her daughter Stella who is in heaven, “Stella, listen to your mother. Go sit at the foot of the Lord and beg him to heal Angela.” As she said it, I visualized it and again felt the thin veil between heaven and earth as I could feel those in heaven praying for Angela with us. It was a beautiful time of sisterly love, heavenly love and powerful prayer! As I am walking through this time with my friend, I cannot help but have deep heartache not only for her suffering, but for the suffering of all those I hear prayer requests for on Facebook, on my blog or in person. Because I share my own story of suffering, I am blessed to have many encounters with people around this country who are watching loved ones suffer greatly or are suffering themselves. I think the response to hearing so much suffering is to become apathetic and try to put it out of our minds because to actually think about or walk through other people’s suffering is painful and heartbreaking. But there is also great grace and purpose when we lend a hand, devote time in prayer, and make time to just be present to those in need. We cannot be crippled by the pain and heartache involved in suffering but rather be grateful for the incredible lessons to be learned when the focus is centered on the love and mercy of Christ. We must focus on the good that comes from suffering and draw strength from our own suffering and that of others. Jesus demonstrated great suffering on the Cross, and it brought about the Resurrection and real freedom. Let us draw strength from His suffering and unite our own to His on the Cross. Note: To read more about Angela or to donate to her medical costs, go to www.angelafaddis.com. Also, Angela did get out of the hospital after five days. Antibiotics are helping the infection! To read Francesca’s powerful blog go to www.forthecauseoflove.blogspot.com. Her latest Blog speaks about this prayer time with Angela as well. It was beautiful to read her perspective! her in prayer , I could just feel the power of the Holy Spirit as I read. Thank you for being there.